Telluride’s valley was used by the Ute or Nuchu tribe for centuries as a summer camp and a hunting ground for deer, wild turkey and grouse. The nomadic Utes, hunter-gatherers who roamed the Western Slope starting around 1000 A.D., would head to valleys at lower elevations with milder weather for the winter. Spanish explorers in the Dominguez-Escalante Expedition passed by Telluride in 1776 and named many of the area’s landmarks, including the San Juan Mountains, the San Miguel River, and the San Sophia Ridge. Other Spanish explorers gave the name “Ute” to the Nuchu tribe, and the state of Utah later was named for the tribe. Prospector John Fallon made the first lode claim for gold in the Marshal Basin above Telluride in 1875. His claim led to the Smuggler and Union mines, which $18 million worth of ore by 1889. Other prospectors flocked to the area, and the town was founded in 1878. The original name was Columbia, but the post office confused it with a California town by that name, so the name was changed to Telluride after the element tellurium, which is found in compounds known as tellurides that are associated with gold and silver deposits. The mountains around Telluride proved to be rich not just in gold but in silver, copper, lead and zinc as well. 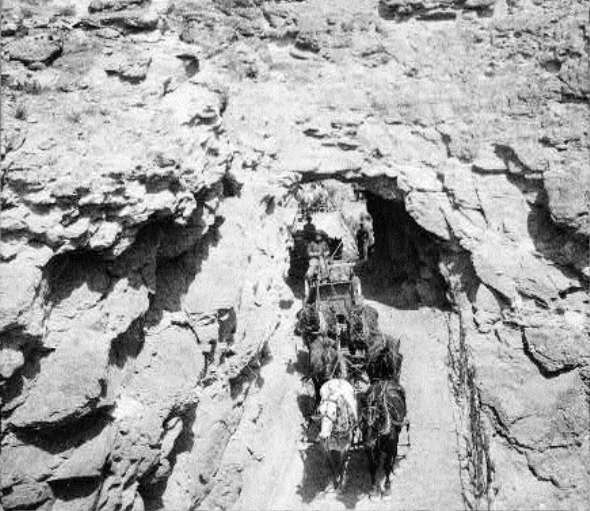 But the area developed slowly because of its isolation and the necessity of using burros to transport ores over narrow mountain trails. One of these trails climbed over Imogene Pass into Ouray and was upgraded later into today’s popular four-wheel drive road. From Ouray, the ore went by ox train to Alamosa and then by rail to Denver. Telluride’s main street, Colorado Avenue, was built extraordinarily wide so that a train of six or eight burros loaded with ore could turn around. Entrepreneur Otto Mears opened a toll road that carried wagons across Dallas Divide to Telluride in 1881, making it easier to transport ore and goods, and San Miguel County was carved out of Ouray County in 1883, with Telluride as the county seat. Even more important than the toll road was the arrival of the Mears-led Rio Grande Southern Railroad in 1890 with a route that ran from Durango across to Dolores, up to Telluride, over the Dallas Divide and ended in Ridgway. The section from Ridgway to Telluride was built by 1,500 workers in 206 days at a cost of $5 million. Gold production boomed from $50,000 a year in 1882 to $1 million by 1888 thanks to the railroad, according to the U.S. Geological Survey. Rail service set the stage for Telluride to become a supply and transportation center for local mines, and the town exploded from a population of 766 in 1890 to 2,446 in 1900. The town had 59 saloons and a string of cribs for prostitutes on Popcorn Alley by 1891, along with gambling houses and social halls. More than 90 percent of Telluride’s homes were built between 1890 and 1910. In 1889, Butch Cassidy, a 23-year-old Telluride resident and horse thief, staged his first bank robbery with three other men, taking $24,580 from the San Miguel Valley Bank in Telluride. The bank building later burned down and was replaced in 1892 by the Mahr building, which still stands on Colorado Avenue. Cassidy went on to organize his famous Wild Bunch gang and stage a series of train and bank robberies across the West. Telluride made news in 1891 as local lawyer and banker L.L. Nunn financed the work of Serbian inventor Nikola Tesla and American entrepreneur George Westinghouse to build the Ames Hydroelectric Generating Plant, the world’s first commercial-grade alternating-current power plant. The plant was located south of Telluride and began by supplying power to a mill at the Gold King Mine three miles away and by 1894 was serving the town and other mines as well. The plant was built during the “War of Currents” between the AC power advocated by Tesla and Westinghouse and the direct current power being pushed by inventor Thomas Edison. Alternating current eventually won. Telluride’s most famous mines were the Smuggler-Union, Tomboy, Pandora, Liberty Bell and Sheridan. From 1875 through 1959, San Miguel County produced 3.8 million ounces of gold in addition to large quantities of silver, lead, zinc, and copper, according to the Geological Survey. The resulting wealth can be seen in the Victorian homes and commercial buildings that fill Telluride’s historic district, along with the boast that Telluride had more millionaires per capita than New York City in 1900. In the mines, the shifts ran 10 to 12 hours, and the work was around the clock. The pay was $3.50 a day or less, and the work was dangerous, with premature dynamite blasts, fatal gas buildups, cave-ins, and fires, plus risks of falls, avalanches and diseases such as pneumonia in the harsh winters. Some miners lived in company boarding houses perched on mountainsides, while others slept in tents and shanties. The panic of 1893 caused the price of silver to fall sharply, and 100 silver mines in the Telluride area closed. The area’s gold mines, however, kept the town alive, and the town saw a building boom with the completion of the Sheridan Hotel and Telluride Elementary School in 1895 and the Miners Union Hospital Building in 1902. The famed orator William Jennings Bryan, who won the 1896 Democratic nomination for president with his convention “Cross of Gold” speech condemning the gold standard as the tool of wealthy Easterners, gave a reprise of the “Cross of Gold” speech from a platform in front of the Sheridan Hotel in the late 1800s or early 1900s. Low pay and long hours led miners to unionize under the Western Federation of Miners in 1896. A strike was settled in 1899 with most mines agreeing to pay miners $3 a day for an eight-hour day, plus $1 a day for board. But the Smuggler-Union mine, the region’s most successful, was under new ownership in 1901 and switched to a system that paid miners based on how much of a vein they mined, which sharply cut the miners’ pay and lead to a strike. The mine hired strikebreakers for the wage of $3 for an eight-hour day that the unionized miners were seeking, which raised tensions between the two sides. A July shootout between striking miners and strikebreakers left one striking miner and two strikebreakers dead and three wounded, including the mine superintendent. That, along with the plummeting production from the strike, led the Smuggler-Union to reach agreement with the union. In 1903, millworkers demanded an eight-hour workday and staged a walkout. They were joined sympathetic miners who had other grievances. Gov. James Peabody responded by sending in the National Guard, which loaded more than 100 striking miners into railcars and left them at the end of the line in Ridgeway, with warnings not to return. Many did, and a citizens’ group, armed with National Guard rifles, expelled 78 of them again. The strike continued until 1904, when the union conceded defeat. Several mines were closed for extended periods in the early 1900s as a series of disasters struck the area. A 1901 fire in a building at the Smuggler-Union mine killed 28 workers. A year later, a snowslide struck the Liberty Bell mine, sweeping away the boarding house and some bunkhouses, and a second snowslide hit rescuers, leaving a total of 16 dead and 10 hurt. In 1914, a spring cloudburst sent mud and rocks from Liberty Bell down Coronet Creek and into town. The debris stood five feet deep on Colorado Avenue and halfway to the ceiling in the bar at the Sheridan Hotel. In 1913, the Segerberg Opera House opened with a 236-seat theater that drew performers such as the actresses Lillian Gish to Sarah Bernhardt. The theater eventually became known as the Sheridan Opera House because it was located next to the Sheridan Hotel. During the 1929 crash, the Bank of Telluride was hard-hit, but bank President Charles Waggoner used a complicated series of illegal transactions to pay off his bank’s $500,000 in debts at the expense of six New York banks before regulators shut down his bank. “I would rather see the New York banks lose money than the people of Telluride, most of whom have worked all their lives for the savings that were deposited in my bank,” Waggoner testified. He was convicted and sentenced to 15 years in prison. After the crash, the railroad economized by building the “Galloping Goose,” which had a Buick or Pierce-Arrow body atop railroad gear and an angled metal snout to plow snow. The railcars carried some freight, a few passengers and the U.S. mail. The nickname came from the way the railcar seemed to waddle down poorly maintained track and blasted an airhorn that sounded like a goose honking instead of a train whistle. The railroad made seven of the railcars in all, and, after losing the mail contract, converted the Goose in 1950 to carry 20 sightseeing passengers, a service that lasted until 1952. The mining companies began to consolidate in the late 1930s, and the production in the mines and the population bounced back to $700,000 a year from 1934 through 1959 and the population grew to 1,337 residents for the 1940 Census. The demand for copper, lead and zinc during World War II spurred mining in the area, led by the Idarado Mining Co., a subsidiary of Newmont Mining Corp. Idarado had acquired most of the mines in the area by 1953 but gradually closed them, leaving open just the Pandora mine and mill east of town. It shut down the Pandora operation in 1978. In 1961, nearly the entire town was designated a National Historic Landmark District because of its historic role as a frontier town and precious metals mining district and its “19th century western mining ‘boom town'” architecture. Telluride’s next boom was driven by the snow, or “white gold,” that had long been the curse of miners. Joe Zoline, a lawyer and investor who lived in California and owned a ranch in Aspen, saw the potential for an elite ski resort in the mountains just south of Telluride and hired Emile Allais, a French Olympic skier, to help configure runs and lifts. The Telluride Ski Area opened in 1972 with five lifts and a day lodge at an altitude of 9,500 feet in Prospect Basin immediately south of Telluride. In 1975, Zoline opened the Coonskin Lift to connect Telluride directly to the ski area, a 1,845-foot vertical rise. Zoline and a Swiss partner sold the ski area in 1978 to Colorado investors led by real estate developer Ron Allred. Allred sold a majority interest in 2001 to Hideo Morita, whose father had founded Sony, and Morita in 2003 sold a majority interest in the Telluride Ski Resort to investor Chuck Horning of Newport Beach, Calif. The Telluride area also developed summer festivals for film, arts, bluegrass, jazz, blues, chamber music, mushrooms and technology and blues to draw upper-income visitors. The Telluride Regional Airport was added in 1990 on a plateau five miles west of the town and 1,000 feet above the valley floor. The airport sits at an altitude of 9,078 feet, which makes it the highest commercial airport in North America.